It's the most recent book on Edenics. It's been out for a while (and was dealt with in some detail in the blogosphere, including on the Log, like here), but a reader reminded one of our contributors about this project. I was surprised to hear (around 1:33) that "today's linguists finally accept the fact that the whole planet spoke one language; they call it Proto-Earth." Really? EDENIC (Proto-Semitic, best documented in Biblical Hebrew) was HARD-WIRED in the brains of Modern Men (since Eden). Its software design matches the hardware ANATOMY of Lips, Throat, Tooth Ridge, Nose, Tongue, and Whistling Air (to pronounce the letters/sounds). Then, in Shinar (Sumer, referenced as the later Babel) a neuro-linguistic disturbance was the Big Bang of language dispersion. The Continental Congress nearly made Hebrew the language of the new republic, as much to break away from England as to reaffirm America's status as the new Promised Land. Historical linguistic interests of the time had as their background the Greek tradition … and the biblically based interpretation of Hebrew as the original language (Lingua Adamica, Lingua Paradisiaca) before the confounding of tongues at Babel. It was common to attempt to fit the European languages into the biblical tradition. That is, these guys are carrying on a long tradition here, all dressed up in current terminology. It's not merely that languages got changed, but our hardwiring — the 'neuro-linguistic disturbance'. The site hasn't been updated much lately, but even so, this year is a big anniversary of the Origin of Species, of course, so it's worth a quick note. His theory seems to be that God was a sort of weak cryptographer, who didn't actually create any new languages after Babel, but simply mixed up the old ones ("letters that shift in sound and location, and letters that drop in and out") in ways that Mozeson has figured out how to decrypt. Genesis 11 does not reveal the mechanics of the TOWER OF BABEL’s “confounding,” but global Edenicists are making great strides. This purposeful irregularization vitiates any appeal to systematic sound correspondence. All you need is some word in any language that shares some sound with some kind of phonetic similarity to some Hebrew word, place or manner of articulation of a consonant, for instance. No more wowing for today. 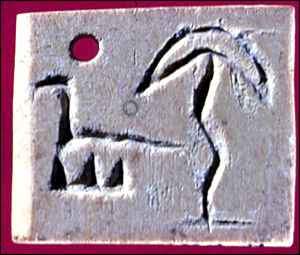 Image from here – one of the claimed samples of earliest human writing. Labels: (pseudo-)science, Historical linguistics, WTF? I'm normally pretty cynical, but I'll add another wow to this. By the way, the Hebrew as almost official language of the US thing was debunked by Cecil Adams' Straight Dope, here. So, is this the craziest single language-related deal out there? At some level, this has got to be a joke, right? Cannot possibly be serious. It sounds like someone got all their linguistic facts from Neal Stephenson's Snow Crash. Didn't know the Straight Dope thing, thanks, Anon. The craziest language-related deal? Very high bar. But they seem to be snowboarding into the final round. Ahhhh, Snow Crash. Haven't thought about that in a long time. Along with all the other hallmarks of a classic cargo-cult science, Edenics seems to include a persecution element, focusing the blame on none other than Chomsky. When asked for references, Mozeson's first reaction is to assume the questioner must be Chomsky or one of his students. Due to its coherence, Edenics presents a fascinating case for those of us interested in pseudoscience, but like the rest, it's ultimately too sad to dwell on long. I picked Mozeson's earlier book apart myself here a few years ago. Thanks, I didn't know your stuff on Edenics. The whole deal is sad, and gets sad fast when you start to ponder it. Good point -- that is at least as weird and maybe weirder. Really shares a lot with Edenics, in some sense. I had a specific reason for thinking Nyland's work was weirder, which I forgot to mention. He thinks that all modern languages (except Basque) were created by Benedictine monks using Basque as a base, as part of a huge conspiracy. Oh yeah, the Name of the Rose deal. It's clear, game over. This is a brilliantly fascinating post about the origins of Hebrew. There is lots of evidence that Hebrew is ultimately what other languages derive from, such as Mozenson's book, "The Word: The Dictionary That Reveals the Hebrew Sources of English". Also children naturally read from right to left, and have to be trained to go the other way. That's why they make so many mistakes when learning to read such as back to front letters, reversing words, etc. The reasons are for particular languages being written (and consequently read) from right to left or left to right or top to bottom or bottom to top. For example, Ancient Greek was written (and read!) all four directions depending on who was doing the writing, although a R-to-L convention was adopted as a standard. Japanese can be written both top to bottom and left to right, depending on the medium and preference of the author. There's even a slight trend to write right-to-left in Japanese due to a Western influence. Unless you can back up your claim, I see it as having no basis. I'm writing you from Belgium. Is has been a few years ago now that I got into contact with the point of view of Mr Moseson. I speak Dutch, French, Spanish, German, English and have some more than just basic knowledge of Hebrew. I'm an engineer, so mathematically oriented and not esay to convince without clear proof. I can tell you, knowing all those languages, it is so easy to see the connection between all these languages, with Hebrew as the root. But if you have no knowledge of Hebrew you simply won't be able to see it. Sorry for the people who disregard his point of view as nonsence. First you need to study to be able to judge.